Some of my students felt that the blogs were too wordy for them. So I’ve added a few summary notes as you go. As always, let me know your thoughts! Since I was a youth, I was told by all my coaches to set “achievable goals.” As a teacher, I have been told countless times to help my students establish realistic goals that they can achieve. Since opening the Compete Academy, I’ve been told several times to “be realistic” and have heard countless parents and kids discuss “achievable goals” and “limitations.” And until a few years ago, I lived most of my life – as did most of the educational specialists that I’ve read – under the notion that setting and reaching “realistic goals” is the path to success. When my college coach made this speech, I was part of the 99.9% of the world who had convinced themselves that success was defined by reaching some modicum of an “achievable goal.” As a team that year, we didn’t come close to winning a national championship, we didn’t come close to winning a regional, and we didn’t reach our pre-established “achievable goal.” But neither my coach, my teammates, nor myself seemed to really care that much that we failed to reach our “realistic and achievable” goals. When I was done playing baseball, I entered a regional 5k race to feed my need to compete. I figured running a 5k was a realistic goal. So, I printed out a 5k training guide and bought some running sneakers. On race day, I noticed the registration tents for the 5k and the 10k. There were 10 times more entrants in the 5k race than the 10k. At the starting line – I was about 50 rows deep from the front of the pack before the gun. Talk about a disadvantageous way to start my running career. The race didn’t even start and I was already in 500th place! At the conclusion of the race, I ate my banana, drank my gatorade – and even though I had achieved my goal of running a 5k – I felt disheartened over the fact that 100s of random people finished ahead of me. I had believed the 5k race was a reasonable goal and judging by the number of entrants – so did many others. Consequently, it would have been significantly easier to place in the 10k race than it was to place in the 5k race. And that’s the paradox of realistic goals, the competition for an “achievable” goal is much fiercer than the competition for a more intimidating goal. In sports, there are significantly more kids actively training to be All-Star little league players than there are training to be professional players. There are significantly more kids trying to make their high school teams than there are training to be collegiate All-Americans. In academia, there are significantly more kids competing to be in the top 20% than there are trying to be valedictorian. In industry, there are significantly more people competing for the entry level job than there are for the CEO position. The former are all realistic goals. The latter are all unrealistic. The takeaway isn’t that everyone should train to be a pro or a CEO; it’s simply that competition declines as the goals get more difficult. THOUGHT #1: COMPETITION IS GREATER FOR REALISTIC GOALS THAN FOR UNREALISTIC GOALS. CONSEQUENTLY – IN A ZERO SUM ENVIRONMENT – IT’S HARDER TO ACHIEVE A REALISTIC GOAL THAN IT IS AN UNREALISTIC GOAL. In my experience, successful people define “success” in their own way and then obsess over achieving that subjective success. 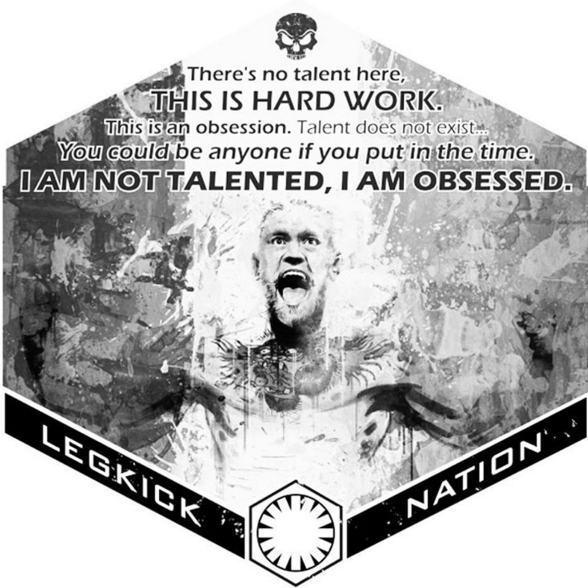 They aren’t simply dedicated, they aren’t simply determined – they are obsessed. Many times, their obsession leads to them being aloof to the outside world, standoffish, quixotic, arrogant, selfish; because they are so intently focused on achieving success many times they turn other people off. It is the obsession with this unrealistic goal that drives them. However, since we are young we are told to “dream big” yet – ironically – set achievable goals. And based on our socially constructed brains, we don’t obsess over things we view as easily obtainable. Therefore, realistic goals – if not pushing our limits of human potential – don’t foster an obsession within us. When preparing for the 5k, some days I ran, somedays I ate healthy; but most days I ate cocoa pebbles and sat on the beach. Why? Because as a former collegiate athlete, a 5k was definitely a realistic and achievable goal. Moreover, running a 5k was already achievable – it wasn’t something that would push me to the limits of my physical capacity. I didn’t need to obsess over it. I didn’t need to sacrifice to achieve it. I didn’t need to live, sleep, breathe, eat, running a 5k in order to achieve it. Conversely, had I had the unrealistic goal of running a marathon, the 5k race would have served simply as a benchmark; not the end goal. I would have been forced to intensely focus on my training and meet various benchmarks in order to eventually complete the marathon. Instead, I settled on running a 5k as my realistic goal. And because of the mediocre intensity of my training – I was rewarded with mediocre results. THOUGHT #2: REALISTIC GOALS CAN BE ACHIEVED WHILE BEING WHOLLY UNINSPIRED. UNREALISTIC GOALS CAN NOT BE ACHIEVED WITHOUT OBSESSION AND SACRIFICE. Is it possible to know our future limitations? Or, do we simply fit into the limitations established by our own self-manifested expectations? Realistic, achievable goals are born from the limitations we set for OURSELVES. These limitations are heavily influenced by our families, coaches, teammates, friends; although parents tend to set goals for their kids – our potential ALWAYS comes from within. And these limitations we provide for ourselves represents the floor and the ceiling of what we believe possible. So we set realistic goals within this range of perceived possibility. But ultimately, it is simply a guess on our future potential. My coach and teammates believed we were around a .500 baseball team – maybe a little better, maybe a little worse; but .500 was an achievable goal. How did we know we weren’t a national championship caliber team? How could we possibly know that if we trained for x months and lived, breathed, and obsessed over a national championship that we wouldn’t be able to compete with the best? We didn’t know. We guessed. And because we simply guessed about our future ability, we handcuffed ourselves to mediocrity (despite beating the future national champions and sweeping that year’s conference champions). This parallels an economic and logical fallacy – anchoring bias. We place importance around a number (our sub .500 record the previous year) which causes an error in our predictions. We then focus on the number predicted and set our expectations within that number’s range. Although I know now how grossly overrated batting average is, in college I had established a goal of hitting .300. During the year, when I was hitting .330, I felt happy because I was above my goal. Soon enough, my average regressed below my goal. I ended up complacent because: “I was close.” But how do I know I shouldn’t have batted .500? How do I know instead of numbers, I shouldn’t have been obsessed with the unrealistic goal of being a Major Leaguer. If my obsession reflected in my planning and training to bat .500 or becoming a Major Leaguer, maybe I reach these goals that I didn’t think realistic. Or perhaps I fail to reach them but bat .400 – which would have destroyed my final average. Or, maybe I would have batted exactly what I batted. We don’t know since limits and achievable goals are simply guesses based on logical errors. In terms of performance, we are crippled by our insecurities. As previously discussed, we fear failure and seek to avoid it at all costs. Setting “achievable” goals, therefore, is simply a preventative measure. For example, I knew that I could finish a 5k by training a couple times a week. The race would not break me down mentally, emotionally, physically. However, I knew that a marathon would require a significant amount of preparation and sacrifice. I also realized that it had the potential to mentally and physically break me. As a competitor, I can’t imagine quitting and giving up in the middle of a race. It scares me. Therefore, I set my sights on a goal that I knew wouldn’t break me – the 5k. In baseball, since we are little, we are told “don’t strikeout.” So we set the achievable and realistic goal of “putting the ball in play.” However, “putting the ball in play” is not going to push the limits of our potential. Rather, it is simply a goal in which we know won’t break us. Watch a parent or player react after a strikeout versus a fly ball out. Both outs, but the failure of striking out fosters a much greater reaction. So instead of setting unrealistic goals like hit a ball 100 mph and obsessively trying to reach them; we set realistic goals to “make contact.” All because we fear the negative emotion that comes with failure. Run through a list of successful persons in your industry and you’ll see examples of people that have tried, failed, tried, failed, etc in some form. As previously discussed, failure is simply a byproduct of the road to success. This past weekend Conor McGregor lost a UFC fight. It has drawn impassioned reactions from around the world. Set aside your opinion of Conor McGregor based on his brashness or his verbal assaults – which is a tactic he uses to drive interest to his fights in order to secure bigger money purses – he was trying to achieve something that no competitor in his sport has ever done. And he failed. In historic fashion. He had to face social media backlash, peer hatred, and fan mockery. But simply by trying to accomplish something that most believe unrealistic – he secured the highest pay of any fighter in the sport’s history and established himself as a transcendent superstar in the sport. Moreover, he learned exactly what it would take to be successful in future attempts. Had he accomplished what most believed unrealistic – he would have become a legend, an historical figure in the world of mixed martial arts. But he failed and now he can choose to learn from his failure, grow and continue to set unrealistic goals for himself; or he can wallow in his defeat and handcuff himself to mediocrity. It takes courage to attempt something in which failure would surely foster agony. But without trying, how can we possibly know what is and what isn’t achievable? How can we possibly know what our limitations are if we aren’t continually pushing ourselves to our maximum capacity? THOUGHT #4: REALISTIC GOALS ARE CONFINED BY OUR FEAR OF FAILURE. RESPECT AND UNDERSTAND FAILURE; BUT DON’T FEAR IT – LOVE THE CHALLENGE AND THE OBSESSION NEEDED TO CONQUER THE UNREALISTIC. Why do I love sports and education? Because I get to witness people achieving the unrealistic… the “impossible.” In our daily lives, we get to witness people putting a dent in the universe, we get to witness people show us how great they are, we get to see people pushing themselves to their maximum capacity. We get to witness failure, we get to witness the comeback and we get to witness triumph. We get to witness people train on the edge in order to capture some goal that seemed impossible to others. Ultimately, we get to witness ordinary people set extraordinary goals and then obsess, sacrifice, and live and die while trying to achieve them. I wish I could go back and obsess over playing middle infield in the bigs instead of being told to set achievable goals. I do not know if I ever would have attained that goal; but I do know that I would have come a lot closer than I did. I also know that I wouldn’t be sitting here reflecting on how I nibbled on mediocrity instead of choking on greatness. In the end, we all have different passions, different ceilings and different ideals. For some, running the 5k was the max of their current capacity and passion. For others – like myself – it was a small reach based on self-imposed limitations and fear. Don’t be afraid to live with passion while setting your goals so high that others think you’re crazy. Don’t be afraid to obsess over achieving the unrealistic. Don’t be afraid to show up and lay it all on the line. Don’t be afraid to train on the edge knowing that everyone will doubt you. And most of all, don’t be afraid to fail. You’re pushing yourself to the max of your human capacity. Failure, therefore, is simply a hurdle along the path of your true greatness. Best part is you share this view with your athletes!! Great read! The idea behind this post reminds me of this video ….. Put me in coach. I am bringing my bat and glove to Hamilton for the next session !!! Great read. No more participation trophies! Very well said. George Steinbrenner comes to mind when I read this. He wanted to win every game 162-0 was his goal along with a world championship. Love the thoughts as usual….There is no other place like CA to help student athletes work on their individual and team goals. That said, your mediocre goal of running the 5k was really very close to being a very challenging goal. By adding finish the race in 12 minutes to your initial goal would have certainly moved you away from snacking on coco pebbles and challenged you to work towards running a sub 4 minute mile pace for the race. Sometimes a little help from a mentor, coach, parent, etc… is needed while defining a goal. I love reading your blogs etc. I love the influence you have had on my son and I hope he has read this too!! I don’t know if you realize the impact you have made in not only the kids but the parents. You have to fail in order to succeed.